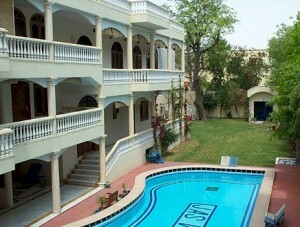 Welcome to Red Fox Hotel, Jaipur. A contemporary, select service economy hotel that offers visitors a royal treat in the land of the Maharajas: Smart accommodation, uncompromising cleanliness, zippy service and a bold, playful atmosphere at an incredibly economical price. A unique hotel guaranteed to bring color into the lives of both business and leisure travelers. Each of the 183 rooms & suites feature an array of modern conveniences including an LCD TV with multi-channel cable, tea and coffee maker, high-speed WiFi net access and well-appointed bathrooms. Welcoming you with smart interiors, the hotel also offers a cyber kiosk, a conference room, an 18 hour multi-cuisine coffee shop – Clever Fox Café and a fitness center that keeps you feeling zippy. Welcome to Red Fox Hotel, Jaipur. A contemporary, select service economy hotel that offers visitors a royal treat in the land of the Maharajas: Smart accommodation, uncompromising cleanliness, zippy service and a bold, playful atmosphere at an incredibly economical price. A unique hotel guaranteed to bring color into the lives of both business and leisure travelers.Each of the 183 rooms & suites feature an array of modern conveniences including an LCD TV with multi-channel cable, tea and coffee maker, high-speed WiFi net access and well-appointed bathrooms.Welcoming you with smart interiors, the hotel also offers a cyber kiosk, a conference room, an 18 hour multi-cuisine coffee shop – Clever Fox Café and a fitness center that keeps you feeling zippy. Inclusions: Welcome drink • Breakfast & Dinner • Sightseeing at all the destinations will be a part of the tour package too • Air-conditioned Indica car will be at your disposal for all the transfers. If you have not decided yet or wants to customize tour itinerary or hotels listed above in "2 Nights Hotel Red Fox Package in Jaipur Rs.6999/-", then we can change the travel itinerary and make a personalized, tailor-made holiday package, especially for you. We can modify this travel package as per your itinerary, budget, duration and the tourist places you would like to visit, including transportation and airfare should be included or not. Please fill the form below to contact us.